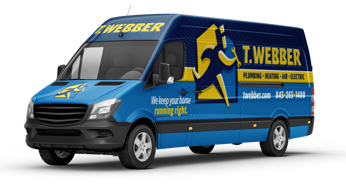 At T.Webber, we provide complete plumbing repiping services throughout the Hudson Valley, including Dutchess, Putnam, Westchester, Orange, Ulster & Rockland Counties. Repiping is when either a partial section or the entire home’s piping system is replaced. It is often required in older homes after decades of wear and tear have worn down the piping; or if problematic water has wreaked havoc on your home’s plumbing system leaving extensive corrosion or pinhole leaks throughout. Need more information about repiping solutions? Call T.Webber today to schedule a service call. Each T.Webber appointment begins with a thorough examination of your plumbing system to accurately assess not only the problem, but also any contributing factors. After the issue(s) are identified, our team will present you with multiple options to remedy the situation – from immediate band aid solutions, to long term system updates. With your approval, work will often be completed during the same day. At T.Webber, it is always our goal to provide through system diagnostics with expert repairs – at your convenience.